The Department of Agriculture has put rules in place for dog-breeding facilities to comply with a law passed by the legislature during the past session. Breeders face deadlines in January … and then again in four years. 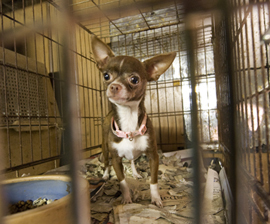 The law that’s been called “The Missouri Solution” requires that the Department of Agriculture put standards in place for dog breeders … Director John Hagler says he’s clarified what that means for facilities. Changes include requirements to provide continuous access to potable water, an annual hands-on exam by a licensed veterinarian and a documented plan of care for any necessary medical treatment. Also, there are precise space requirements that require breeders with existing facilities to double the size of their enclosures by Jan. 1, 2012; then breeders must triple that space for animals and meet new construction standards by 2016. Hagler says he understands the concerns of both sides of the issue … the breeders and the animal rights advocates. He says there are financial implications for breeders, especially amid the recession, and that the department will work with them to ensure they are compliant, offering possible financial resources to bring them up to spec if needed. The department’s websire includes specifications for the approved types of structural plastic flooring, expanded metal with flexible plastic coatings and concrete flooring. He says this year, a $1.1 million budget recommendation from Gov. Nixon will allow the department to add four more inspectors, an investigator and a veterinarian.